One of Warrenville’s best features is its ability to incorporate the natural landscape into the fabric of the town. Located on the banks of the West Branch of the DuPage River, Warrenville is essentially surrounded by a “necklace” of five Forest Preserves and Fermi National Laboratory. Together, these public spaces encompass 10,000 acres of open space and contain approximately 30 miles of off-road bike paths. This vast network of public open space provides many recreational opportunities, including fishing, canoeing, tubing, biking, hiking, cross country skiing, and camping. Those looking for a chance to experience a natural setting should visit the Ferry Creek Wetland Restoration at Summerlakes Park. This six-acre piece of open land has been landscaped for the benefit of water conservation and wildlife resources. The adjacent park features ball fields and other amenities for recreation. Children can enjoy playground equipment and other amenities at any of the four parks situated throughout the city. 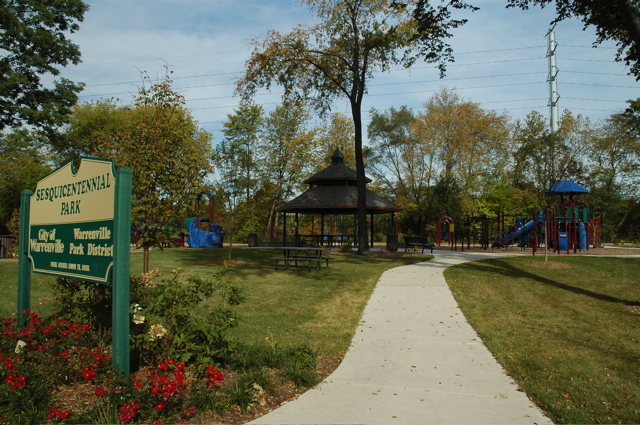 Lions Park is located on the east side of the community, Kiwanis Park on the southwest side, Summerlakes Park on the northwest side, Sesquicentennial Park in the center of town, Leone Schmidt Heritage Park in the downtown, and Warrenville’s premier location, Cerny Park, on the south side of the city. In addition, visitors can go to other open spaces including the Albright Park Gazebo along the Prairie Path across the street from City Hall and the library, Bob Walters Commons between the Warrenville Public Library and City Hall, or the Plum Path sitting area located at Manning Avenue and Main Street. For those who like to walk, jog, bike ride, or horseback ride, the Illinois Prairie Path runs through the center of town. This highly recognized and well-used recreational trail has been the recipient of numerous awards and is nationally recognized. In the event of inclement weather, Warrenville’s Park District Recreational facility located at 3S260 Warren Avenue offers an indoor track and numerous fitness and exercise equipment. Lifetime Fitness also resides in Warrenville at 28141 Diehl Road. It offers exercise and aquatic facilities, children-friendly facilities and a gymnasium. To view local events, establishments and trails view our Visitor's Guide.